Rune Germain is in possession of a gift: a talent for opera that is unsurpassed by any other. In an attempt to help Rune overcome her stage fright and train her voice, her mother sends her to a French arts conservatory located in an opera house that is rumored to be connected to The Phantom of the Opera. It is there that Rune meets Thorn – an elusive young man who helps her through her musical transformation and also understands her in a way that no one else can. But Thorn has a secret, and it is this that will lead to the crucial decision he will be forced to make - Rune’s safety or the wrath of the phantom that has been like a father to him all these years. 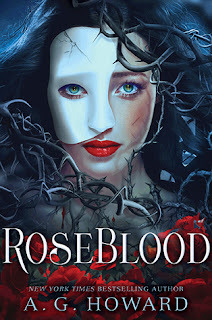 If you’re anything like me and you find The Phantom of the Opera fascinating, I think that you’ll enjoy RoseBlood. It’s an odd book filled with strange coincidences and eerie details, but these seem sensible things considering the source material Howard drew on. It doesn’t mean I didn’t roll my eyes a time or two, particularly when details were a little too pointed or convenient, but it definitely didn’t hinder my reading experience. In fact, the weirdness was what kept me reading! No, what actually proved to be bothersome in the end were the characters. I just could not find it in me to really care about any of them, even though I could see the effort put into giving them unique personalities. Still, Howard deserves credit for writing a tale that perfectly captures the feel of The Phantom of the Opera while also being an oddly fascinating story that stands all on its own. Vasilisa lives with her family at the edge of the Russian wilderness, content to spend her nights listening to her old nurse tell fairytales by the fire. But when her mother dies, her father goes to Moscow and brings back a new wife – a wife who is city-bred, fiercely devout and deathly afraid of the spirits that linger in the house. Vasilisa is the only one who keeps up the rituals to honor the spirits, but her efforts are not enough to battle the tide of darkness and misfortune that threatens to overwhelm the village. With a stepmother determined to tame her by marriage or by convent, and the threat of death and destruction looming over her, Vasilisa must discover her own strength in order to defend the home and people she loves the most in the world. The Bear and the Nightingale is a perfectly dreamy sort of read best suited to be read in the cold of winter, curled up under a comfortable blanket and with a warm drink at hand. 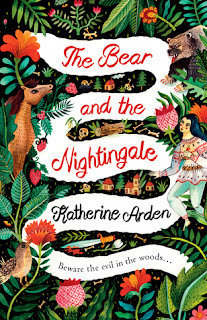 It took me a couple of chapters before I settled properly into the storytelling style Arden employs, though in hindsight, I recognize its similarities to the telling of a fairy tale. But once I was hooked, I was hooked. I was content to allow each chapter to unfold, simply curious to discover what would become of Vasilisa and her family. It certainly helped that it was all too easy for me to feel predisposed towards caring about Vasilisa, who was the sort of brave young lady devoted to what she knows is right that I tend to gravitate towards. Magical and imaginative and utterly transporting, I enjoyed this novel, and believe that others will as well.